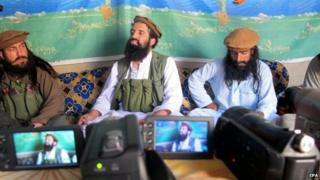 Pakistan Taliban spokesman Shahidullah Shahid has been sacked after pledging allegiance to Islamic State (IS). The militants said he had been replaced but did not name his successor. A statement reiterated support for Afghan Taliban leader Mullah Omar. It emerged last week that Shahidullah Shahid and five other Pakistan Taliban (TTP) commanders had defected to IS which controls parts of Iraq and Syria. Analysts say IS poses a challenge to Taliban, al-Qaeda and other militants. The TTP statement said Shahidullah Shahid was a nom de guerre and its former spokesman's real name was Sheikh Maqbool. BBC Urdu's Haroon Rashid in Islamabad says these are further signs of splits within the Pakistani Taliban, which is already divided. Last week, a senior TTP leader confirmed to our correspondent that Shahidullah Shahid and the five other senior figures had left because they had doubts about the leadership of Mullah Mohammad Omar. The defectors included local TTP leaders in Orakzai, Kurram and Khyber tribal regions and Peshawar and Hangu districts - Orakzai commander Saeed Khan is seen as the biggest loss to the movement. "He was the most important of the five who have left us. Others are not prominent figures," the senior TTP leader told the BBC by telephone from an undisclosed location. The TTP has seen several desertions this year after its leader Hakimullah Mehsud was killed in a US drone strike last November. A major chapter from Mohmand tribal region bordering Afghanistan formed a separate group called Jamaatul Ahrar in August this year. TTP militants from the Mehsud tribal group were the first to part ways with incumbent TTP chief Mullah Fazlullah earlier this year. A long-awaited Pakistani army offensive launched in June has further scattered the insurgents from their stronghold of North Waziristan. Our correspondent says many observers believe the initial success achieved by IS in Iraq and Syria was bound to attract some Pakistani militants. "It was natural, what we are witnessing amongst the militants. They wish to join the rollercoaster," said Zahid Hussain, a senior expert on militancy. Saifullah Mehsud, a researcher at Islamabad-based think-tank Fata Research Centre, told the BBC: "The decision to leave TTP and join IS brings to the fore the extent to which the militants are divided now. The organisation has never been more in dire straits than now." But he did not agree that IS could unite Pakistan's fragmented militants under its umbrella because "IS has no presence and structure in Pakistan". Nevertheless, he said IS could create further divisions among the militants: "There can be only one leader - either Mullah Mohammad Omar or [IS chief] Abu Bakar al-Baghdadi." What is Islamic State (IS)?